At LEAP, we were very proud to play an important role in mentoring the student teams from RMIT to help them deliver their IoT/AR-based solutions to 10 real-world industry problems across 2 exciting days of the Hackathon. It was certainly inspiring to us to see their creativity and ingenuity emerge using Vuforia Augmented Reality (AR) & Thingworx Internet of Things (IoT) technologies – allowing them to deliver impressive and useful solutions in such a short space of time! Emerging technologies including Augmented Reality (AR) and Internet of Things (IoT) are poised to revolutionise every industry, including the Engineering sector. 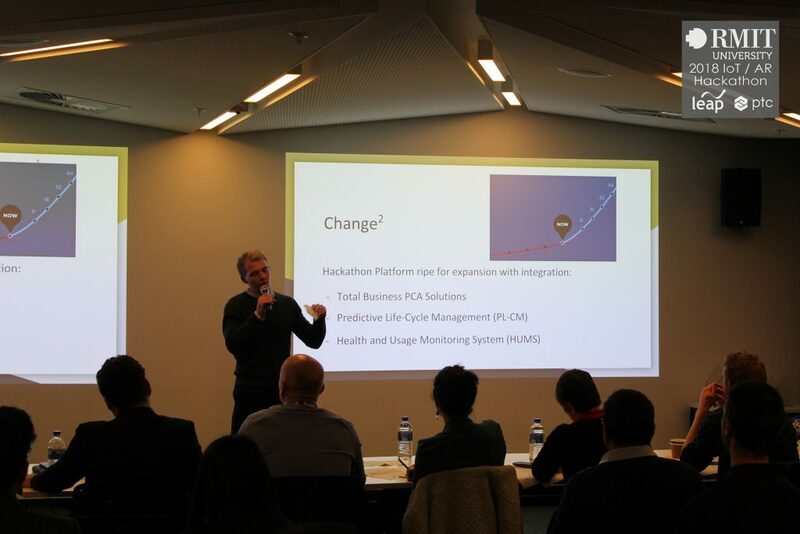 Capitalising on this opportunity, RMIT and LEAP Australia jointly held the Thingworx IoT & AR Hackathon to leverage RMIT student’s problem-solving capability. In a three-day event, industry sponsors provided real-world problems for students to tackle as part of the Digital Innovation Festival (DIF). Industry problems included a product testing & validation management system, condition monitoring of a laser cutting machine, augmented reality enabled smart documents, and electric vehicle performance optimisation. The 1st placed team ‘Supernova’ consisted of five Bachelor of Engineering (Aerospace Engineering) students; Errol Hale, Sean Beattie, Stephen Hardiman, Nilkumar Shah, and Sebastian Lin. As the first hackathon for all members, there was a great deal of excitement at the prospect of working with innovative technologies such as IoT and AR. 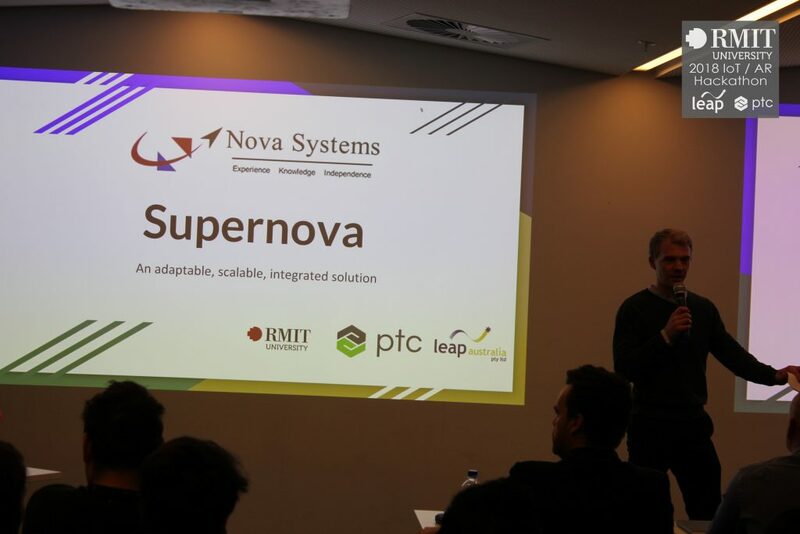 Supernova’s problem was provided by Nova Systems, a Professional Service Provider specialising in engineering and management services. Integrating IoT and AR technology through PTC software, Nova Systems proposed a solution that streamlined their existing Physical Configuration Audit (PCA) process. A PCA is an analysis-based verification of a manufactured product conducted by a test engineer. This process involves comparison between printed 2D design specifications and the physical product, as well as initially recording results through a pen and paper system. Streamlining this process would result in huge commercial value, which was well understood by the Supernova team. Using a Nerf Gun as their product, their AR platform overlayed a 3D CAD model of the gun over the existing real-world equivalent. Viewed through mixed reality smartglasses such as the Microsoft HoloLens, the AR experience would allow a test engineer to undergo the verification by comparing an accurate 3D model with the manufactured product in Augmented Reality. Utilising PTC ThingWorx and Vuforia Studio, a user-interface in the form of a mobile app enabled direct integration of test data with the existing data management system at Nova Systems. Industry judges awarded the Nova Systems team with First Prize based on their teamwork, understanding of the problem, and innovative solution. Every RMIT team that participated in the hackathon demonstrated their readiness for Industry 4.0 by using disruptive digital technologies to solve their respective industry problems. RMIT students across all disciplines exemplified teamwork, creativity, and a strong idea of the business cases that would make their solutions viable and commercially sustainable. Event MC Kariza Martin is herself a PhD student in Aerospace Engineering at RMIT and showed great understanding of the value the hackathon provided. Extensive planning, effective project management, a strong team dynamic, and a desire to produce something of high commercial value were what contributed to the success of the Supernova team. The skills developed through School of Engineering programs were what enabled the team to work productively with full understanding of the system requirements and professional management of the project. They now look forward to applying their new knowledge in IoT and AR technologies to solve aerospace problems far into the future. Thank you to the event organisers, sponsors & industry mentors who provided this fantastic industry relevant experience for RMIT students.